When you are editing on projects that only you touch, your working practices can be as messy as you want them to be. However, if you work on projects that need to be interchanged with others down the line, or you’re in a collaborative editing environment, good operating practices are essential. This starts at the moment you first receive the media and carries through until the project has been completed, delivered, and archived. Any editor who’s worked with Avid Media Composer in a shared storage situation knows that it’s pretty rock solid and takes measures to assure proper media relinking and management. Adobe Premiere Pro is very powerful, but much more freeform. Therefore, the responsibility of proper media management and editor discipline falls to the user. I’ve covered some of these points in other posts, but it’s good to revisit workflow habits. Folder templates. I like to have things neat and one way to assure that is with project folder templates. You can use a tool like Post Haste to automatically generate a new set of folders for each new production – or you can simply design your own set of folders as a template layout and copy those for each new job. 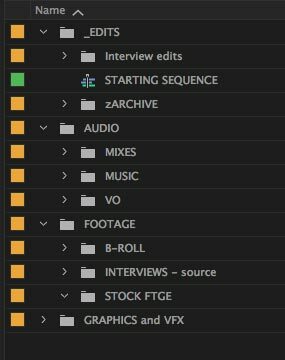 Since I’m working mainly in Premiere Pro these days, my folder template includes a Premiere Pro template project, too. This gives me an easy starting point that has been tailored for the kinds of narrative/interview projects that I’m working on. Simply rename the root folder and the project for the new production (or let Post Haste do that for you). My layout includes folders for projects, graphics, audio, documents, exports, and raw media. I spend most of my time working at a multi-suite facility connected to a NAS shared storage system. There, the folders end up on the NAS volume and are accessible to all editors. Media preparation. When the crew comes back from the shoot, the first priority is to back-up their files to an archive drive and then copy the files again to the storage used for editing – in my case a NAS volume. 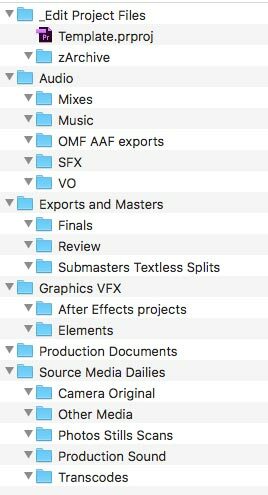 If we follow the folder layout described above, then those files get copied to the production dailies or raw media (whatever you called it) folder. Because Premiere Pro is very fluid and forgiving with all types of codecs, formats, and naming conventions, it’s easy to get sloppy and skip the next steps. DON’T. The most important thing for proper media linking is to have consistent locations and unique file names. If you don’t, then future relinking, moving the project into an application like Resolve for color correction/finishing, or other process may lead to not linking to the correct file. Premiere Pro works better when ALL of the media is in a single common format, like DNxHD/HR or ProRes. However, for most productions, the transcoding time involved would be unacceptable. A large production will often shoot with multiple camera formats (Alexa, RED, DSLRs, GoPros, drones, etc.) and generate several cards worth of media each day. My recommendation is to leave the professional format files alone (like RED or Alexa), but transcode the oddball clips, like DJI cameras. Many of these prosumer formats place the media into various folder structures or hide them inside a package container format. I will generally move these outside of this structure so they are easily accessible at the Finder level. Media from the cameras should be arranged in a folder hierarchy of Date, Camera, and Card. Coordinate with the DIT and you’ll often get the media already organized in this manner. Transcode files as needed and delete the originals if you like (as long as they’ve been backed up first). Unfortunately these prosumer cameras often use repeated, rather than unique, file names. Every card starts over with clip number 0001. That’s why we need to rename these files. You can usually skip renaming professional format files. It’s optional. Renaming Alexa files is fine, but avoid renaming RED or P2 files. However, definitely rename DSLR, GoPro, and DJI clips. When renaming clips I use an app called Better Rename on the Mac, but any batch renaming utility will do. Follow a consistent naming convention. Mine is a descriptive abbreviation, month/day, camera, and card. So a shoot in Palermo on July 22, using the B camera, recorded on card 4, becomes PAL0722B04_. This is appended in front of the camera-generated clip name, so then clip number 0057 becomes PAL0722B04_0057. You don’t need the year, because the folder location, general project info, or the embedded file info will tell you that. A quick word on renaming. Stick with universal alphanumeric conventions in both the files and the folder names. Avoid symbols, emojis, etc. Otherwise, some systems will not be able to read the files. Don’t get overly lengthy in your names. Stick with upper and lower case letters, numbers, dashes, underscores, and spaces. Then you’ll be fine. Project location. 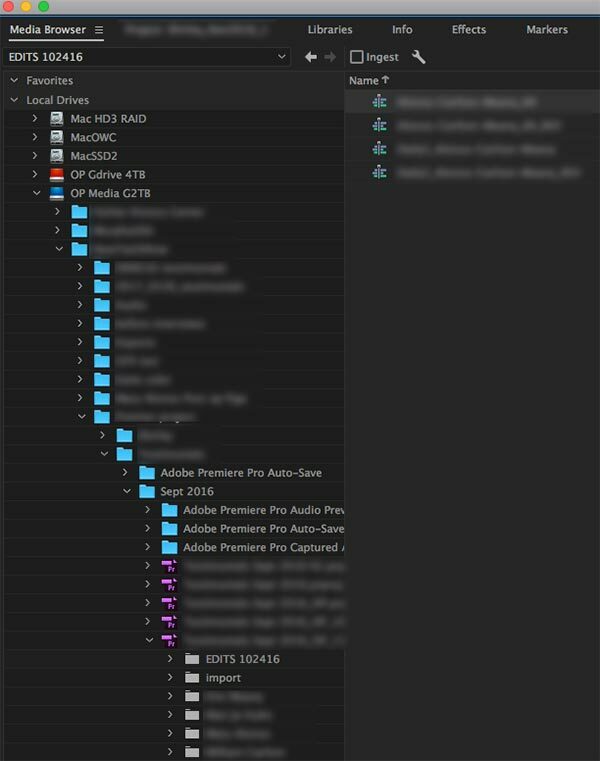 Premiere Pro has several basic file types that it generates with each project. These include the project file itself, Auto-saved project files, renders, media cache files and audio peak (.pek) files. Some of these are created in the background as new media is imported into the project. You can choose to store these anywhere you like on the system, although there are optimal locations. Working on a NAS, there is no problem in letting the project file, Auto-saves, and renders stay on the NAS in the same section of the NAS as all of your other media. I do this because it’s easy to back-up the whole job at the end of the line and have everything in one place. However, you don’t want all the small, application-generated cache files to be there. While it’s an option in preferences, it is highly recommended to have these media cache files go to the internal hard drive of the workstation or a separate, external local drive. The reason is that there are a lot of these small files and that traffic on the NAS will tend to bog down the overall performance. So set them to be local (the default). The downside of doing this is that when another editor opens the Premiere Pro project on a different computer, these files have to be regenerated on that new system. The project will react sluggishly until this background process is complete. While this is a bit of a drag, it’s what Adobe recommends to keep the system operating well. One other cache setting to be mindful of is the automatic delete option. 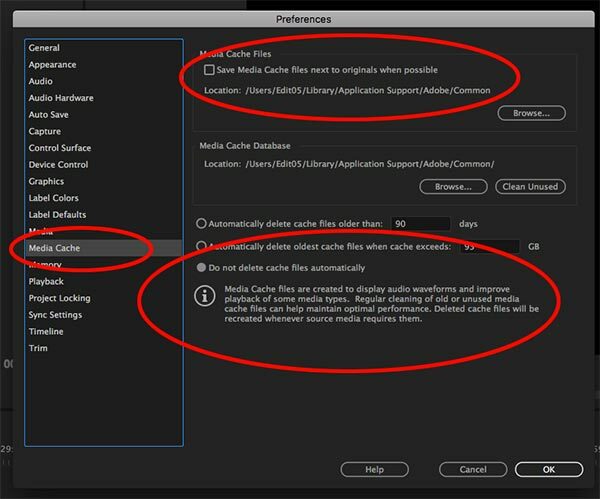 A recent Premiere Pro problem cropped up when users noticed that original media was disappearing from their drives. Although this was a definite bug, the situation mainly affected users who had set Media cache to be with their original media files and had enabled automatic deletion. You are better off to keep the default location, but change the deletion setting to manual. You’ll have to occasional clean your caches manually, but this is preferable to losing your original content. Premiere Pro project locking. A recent addition to Premiere Pro is project locking. This came about because of Team Projects, which are cloud-only shared project files. However, in many environments, facilities do not want their projects in the cloud. Yet, they can still take advantage of this feature. 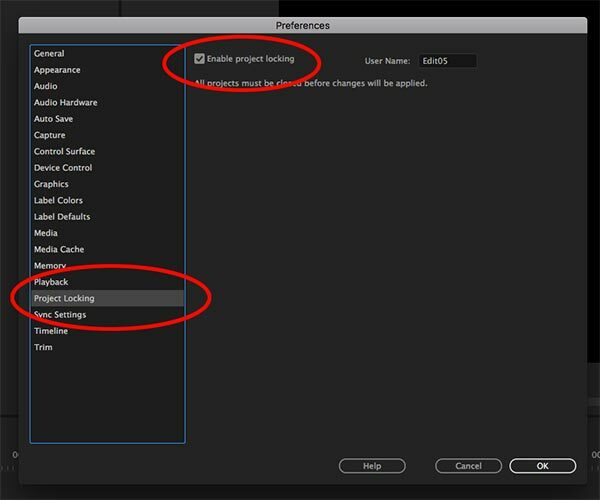 When project locking is enabled in Premiere Pro (every user on the system must do this), the application opens a temporary .prlock next to the project file. This is intended to prevent other users from opening the same project and overwriting the original editor’s work and/or revisions. Unfortunately, this only works correctly when you open a project from the launch window. Do not open the project by double-clicking the project file itself in order to launch Premiere Pro and that project. If you open through the launch window, then Premiere Pro will prevents you from opening a locked project file. However, if you open through the Finder, then the locking system is circumvented, causing crashes and potentially lost work. Project layout templates. Like folder layouts, I’m fond of using a template for my Premiere Pro projects, too. This way all projects have a consistent starting point, which is good when working with several editors collaboratively. You can certainly create multiple templates depending on the nature and specs of the job, e.g. commercials, narrative, 23.98, 29.97, etc. As with the folder layout, I’ll often use a leading underscore with a name to sort an item to the top of a list, or start the name with a “z” to sort it to the bottom. A lot of my work is interview-driven with supportive B-roll footage. Most of the time I’m cutting in 23.98fps. So, that’s the example shown here. My normal routine is to import the camera files (using Premiere Pro’s internal Media Browser) according to the date/camera/card organization described earlier. Then I’ll review the footage and rearrange the clips. Interview files go into an interview sources bin. I will add sub-bins in the B-roll section for general categories. As I review footage, I’ll move clips into their appropriate area, until the date/camera/card bins are empty and can be deleted from the project. Interviews will be grouped as multi-cam clips and edited to a single sequence for each person. This sequence gets moved into the Interview Edits sub-bin and becomes the source for any clips from this interview. I do a few other things before starting to edit, but that’s for another time and another post. Working as a team. There are lots of ways to work collaboratively, so the concept doesn’t mean the same thing in every type of job. Sometimes it requires different people working on the same job. Other times it means several editors may access a common pool of media, but working in their own discrete projects. In any case, Premiere does not allow the same sort of flexibility that Media Composer or Final Cut Pro editors enjoy. You cannot have two or more editors working inside the same project file. You cannot open more than one project at a time. This mean Premiere Pro editors need to think through their workflows in order to effectively share projects. There are different strategies to employ. The easiest is to use the standard “save as” function to create alternate versions of a project. This is also useful to keep project bloat low. As you edit a long time on a project, you build up a lot of old “in progress” sequences. After a while, it’s best to save a copy and delete the older sequences. But the best way is to organize a structure to follow. As an example, let’s say a travel-style show covers several locations in an episode. Several editors and an assistant are working on it. The assistant would create a master project with all the footage imported and organized, interviews grouped/synced, and so on. At this point each editor takes a different location to cut that segment. There are two options. The first is to duplicate the project file for each location. Open each one up and delete the content that’s not for that location. The second option is to create a new project for each location and them import media from the master project using Media Browser. 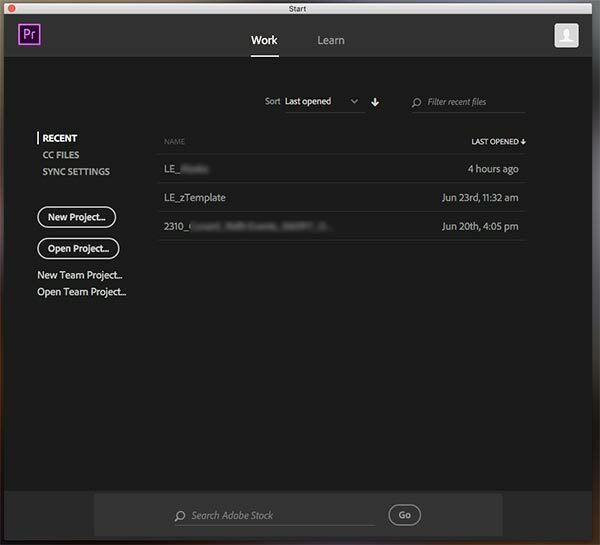 This is Adobe’s built-in module that enables the editor to access files, bins, and sequences from inside other Premiere Pro projects. When these are imported, there is no dynamic linking between the two projects. The two sets of files/sequences are independent of each other. Next, each editors cuts their own piece, resulting in a final sequence for each segment. Back in the master project, each edited sequence can be imported – again, using Media Browser – for the purposes of the final show build and tweaks. Since all of the media is common, no additional media files will be imported. Another option is to create a new final project and then import each sequence into it (using Media Browser). This will import the sequences and any associated media films. Then use the segment sequences to build the final show sequence and tweak as needed. There are plenty of ways to use Premiere Pro and maintain editing versatility within a shared storage situation. You just have to follow a few rules for “best practices” so that everyone will “play nice” and have a successful experience. Click here to download a folder template and enclosed Premiere Pro template project. This entry was posted in general concepts and ideas, Premiere Pro, tips and tricks, workflows and tagged Premiere Pro, workflows.